After starting the blog with either blogger or WordPress, you start publishing quality content to increase website traffic. At time you really don't care for website analysis right. At time you just concern with the daily no. of page views and no. of unique visitor. Even I had same thinking, when I had started my blog. But trust me this is not the only thing you need to take care off. To increase traffic, its time to track the traffic statistics. Its time to track new users per minute, no. of sessions happens, sessions by browser, Avg. session duration and pages / session, Bounce Rate, Revenue, Goal Completions, Real time traffic and much more. Don't panic these all things comes in one tools called Google Analytics. well, GA is a free tool offered by google itself to analytics or track the above mentioned things easily. GA also provides the facilities like Dashboards, Shortcuts, Intelligence Events, Real-time, Audience, Behavior, etc. It will also help you to link your blog or website with google adsense or google webmaster tools. I think its pretty clear now why tracking traffic statistics is important and how Google analytics will help you in getting it. So, lets quickly install google analytics with your blog. As I said its good to link your Google Analytics with Google webmaster tools. So, why not to go in that manner. If you haven't added your site to Google, then first add it. Below mentioned post will help you in adding your site to google webmaster tools. Step 1 :- Login to Google Webmaster Tools. 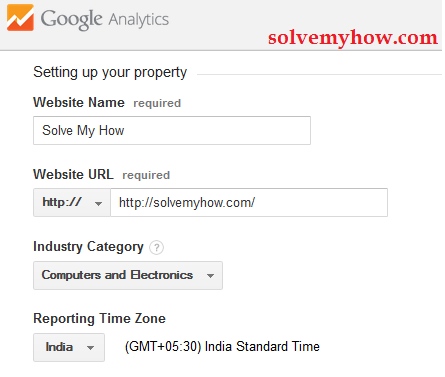 Step 2 :- Go to Manage Site >> Google Analytic Property. You will find it below ADD A SITE button or on the right hand side of you blog title. Step 3 :- Click on Create Google Analytics account. Now you will be redirected to google analytics login page. Step 4 :- If you do not want to link your blog with google webmaster tools (not recommendable). 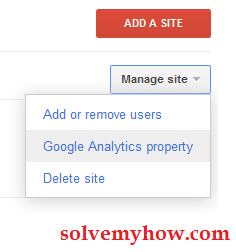 Simply skip above 3 steps and login to Google Analytics (below steps will be same for both the methods). You need google account to login in google analytics. Sign in with your google or gmail account and click on sign up. Step 5 :- Fill the form and create analytics property. Now, you will be redirected to next page, where you have to enter few details regarding your blog like blog url, blog title, country etc. Enter the details and click on Get Tracking ID button. See the snap shot below. Step 6 :- Select your country and click "I Accept" on pop up page of "Google Analytics Terms Of Service Agreement". 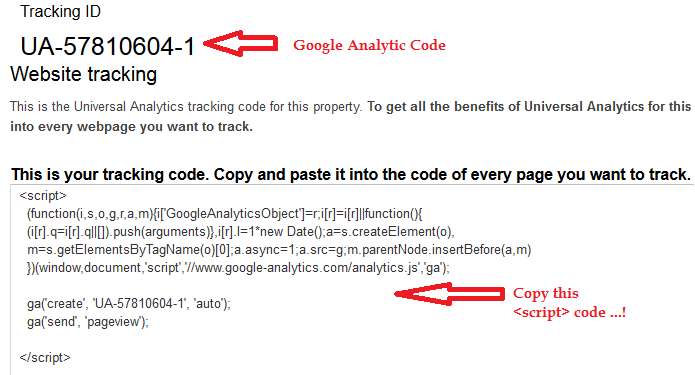 Step 7 :- Now, you will get Google Analytics Code. If everything goes fine, you will get the Tracing ID and Tracking Code (see in the snap shot below) which you have to copy and paste, into your blogger template. To add GA into your blog. You have to do 2 things. Copy and Paste Tracking ID in settings. Copy and Paste Tracing code into blogger template. Step 1 :- Copy and paste tracking ID. Go to Setting >> Other. Google Analytics >> Analytics Web Property ID. Paste Tracking ID in the text field. Click on Save Settings button. Step 2 :- Copy and paste tracking code into blogger template. Go to Template >> Edit HTML. Back up your blogger template. Now paste tracking code in the <body> part of your template. Congratulation, you have added or installed google analytic code/property in blogger. It will take approx 24 hours to show your blog report. After that just go to google analytics dashboard and track your blog report. Hope you found this article helpful. Do share it with your social media friends. So, they can easily install google analytics in blogger. For any query or suggestion please leave your comment below. Do join SolveMyHow on Facebook and also subscribe for SolveMyHow newsletter to get blogger tips right into your inbox ! Thanks for dropping by and for your kind words. Glad to help you.